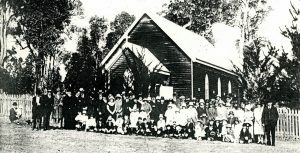 The beginning of Pinjarra’s Catholic Parish began with the first church built in Jarrahdale, around 1885, with the parish extending as far as Queens Park in Perth, out to Harvey, Mandurah, and Rockingham. The earliest Catholic family recorded to settle in Pinjarra at this time was George Greenacre, it is said Mass was carried out in their ‘best’ room. 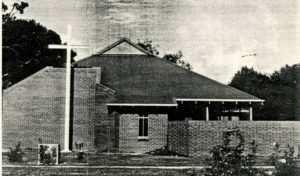 The original St Augustines Church, Forrest St, Pinjarra. 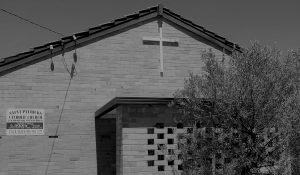 However, by 1912, Pinjarra town had its first church building erected by Father Fahey DSO, a man who served with distinction at Gallipoli and was later the first President of the RSL in Western Australia. 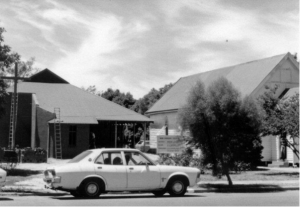 During this time, Father Fahey’s parish was serving 22 Mass stations around WA’s south west. 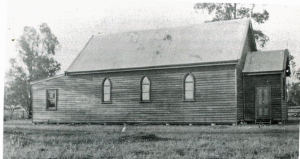 In 1915 the milling town of Dwellingup saw their first church, St Mathew’s, erected, and within 3 years the first “motorised” priest, Father O’Grady, was ministering the parish from nearby Dwellingup until 1925. 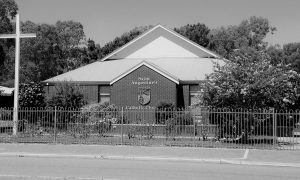 During this time the parish expanded from Jarrahdale to Coolup, but as the adverse effects of the Great Depression fell upon the region, the Jarrahdale school and presbytery were thus relocated to Pinjarra. 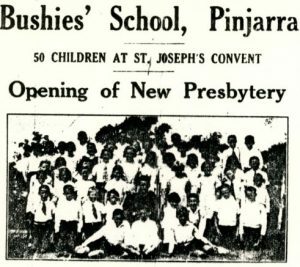 The year 1929 saw the Sisters of Saint Joseph arrive in Pinjarra from Jarrahdale. During these early years, the Sisters, including Sister Florentine, one of the original Sisters now residing in South Perth, began caring for local elderly lady, Mrs Perrett. In turn, Mrs Perrett provided parishioners with good education through ‘bushie’ schools complete with boarding facilities, at a small cost. Further generosity by Mrs Perrett enabled the Sisters to buy the present convent and land upon which our school, St Joseph’s Primary, is now built. St Joseph’s school was thus opened by Archbishop Prendiville in 1954. ‘Old’ St Augustines is moved from Forrest St to George St, Pinjarra. 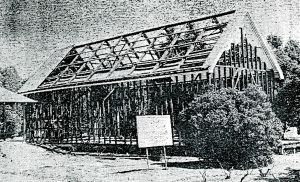 Around 1952 however, the construction of Mandurah’s ‘Our Lady of the Assumption’ church had commenced and was opened by Archbishop Goody on January 6th, 1953. 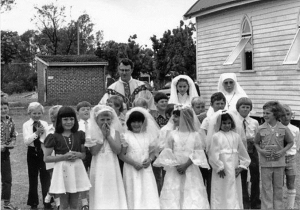 One year later, Mandurah became a separate parish, welcoming Father Harry Brennan to the altar in 1958. 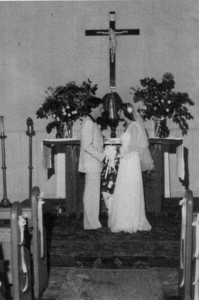 Sadly, come 1961, devastating bushfires saw Dwellingup’s charming St Mathews church destroyed. 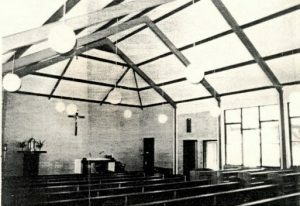 Generous assistance was given by neighbouring Methodist and Baptist congregations and the church was later rebuilt as St Patricks Catholic Church. 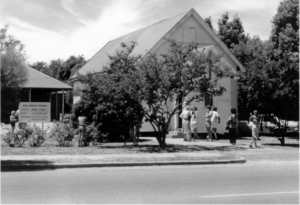 The 1960s and 1970s was a prosperous period for our parish, with St Joseph’s school enlarged and the parish officially transferring to the Bunbury Diocese. Dedicated priests who served in Pinjarra from 1960 were Fr McNamara, Fr Monahan, Fr Diviney and Fr Gaine. A peek inside the original St Augustines church. The new and old St Augustines side by side on George St. The demolition of the church, 1981. Finally, on April 5th, 1981, our church here at Saint Augustines was blessed and thus opened on September 1st, 1985 by Bishop Peter Quinn, with resident parish priest Father John Fitzgerald present during the building of the church and presbytery. Parish priests to follow Fr Fitzgerald were Fr St Kelly in 1987, followed by Fr M.T Dondoyano, Fr E. O’Shea, Fr Doug Conlan and Fr Christudas. The new St Augustines Church, opened in 1985. December 1998 saw an important era came to an end as the parish fare-welled the Sisters of St Joseph of the Sacred Heart after 68 years of loyal, steadfast and dedicated love and service to the school. 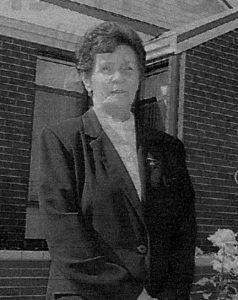 Thus, Sister Maureen O’Connor RSJ, who was appointed Parish Administrator in May 1996, was kept very busy traveling the length and breadth of the parish as she dutifully ministered to parishioners. 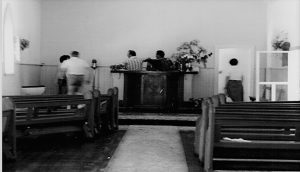 A parish with a somewhat transient past, the 1990’s brought change which saw the community more settled; the boundaries of the parish were stabilized, the school upgraded and enlarged and relations with other religious denominations were positive. Sister Maureen continued ministering here at the parish for the next 18 years until eventually relocating to South Perth in 2014 to begin her new position as hospital Chaplain. Maureen remains a loyal and dedicated servant of our Lord, ministering to the ill and the elderly in nursing homes 3 days per week. We thank her for her unwavering commitment to the parish during those 18 years. In June 2014 our parish was blessed with the arrival of the delightful Father Wayne Bendotti as Priest-in-charge. Popular among young and old, he brought a fresh approach to Catholicism with his open nature and down to earth, inspiring homilies. 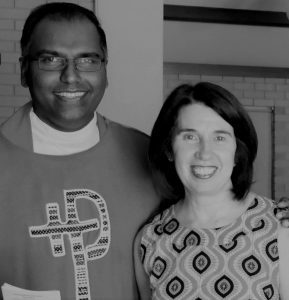 January 2016 saw Fr Wayne’s departure to Dardanup Parish and the arrival of Father Gayan Thamel. A gentle soul, Father Gayan arrived from ministering in Lake Grace and spent the next two and a half years working tirelessly and humbly for St Augustine’s. So much was achieved during Fr.Gayan’s time, his departure to Paramatta parish, NSW, in August, 2018 was certainly felt by many. 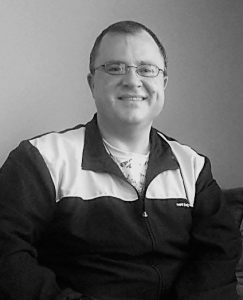 We wish him all the best for 2019 and thank him for the creativeness and ingenuity he brought to St Augustine’s. St Augustine’s parish celebrates the arrival of our new priest-in-charge, Fr. Marcellos Rosales, from WA’s Margaret River region. Fr. Rosales began his stay here in January, 2019, and we welcome him with open arms as we embrace the new liturgical year.